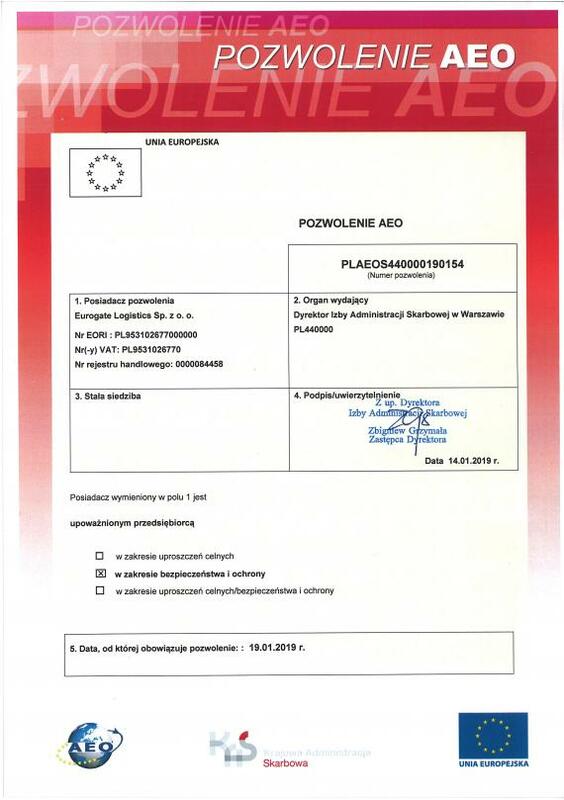 "We proudly inform, that on 19/01/2019, Eurogate Logistics has joined the prestigious group of companies certified as Authorised Economic Operators – AEO S."
The certificate confirms the highest security standards kept by Eurogate Logistics. Following the needs of their key clients and market changes, Eurogate decided a year ago that they should apply for the AEO S certificate. In order to fulfill all strict requirements of the customs office who grant the certificate, Eurogate Logistics decided to review, verify and adjust procedures. First was a starting audit with a detailed diagnosis of all operational processes and I.T. safety. This resulted with a plan of required changes and improvements within the company. One of these changes was a crucial decision to improve Eurogate Logistics' headquarters by becoming more modern & secure - located in the Astrum Business Park, Warsaw. Eurogate's quality department was required to verify all existing procedures and create new ones covering safety of employees, cargo and documents. Furthermore, internal audits were held focusing on Eurogate's infrastructure and financial condition. Finally, custom officers audited the company's HQ and branches with positive feedback. After a year of hard-work and involvement of all Eurogate Logistics employees, the AEO S Certificate was granted. "This confirms that European Union Customs Administration acknowledges that Eurogate Logistics is a credible and reliable business partner." "AEO status is respected within all EU structures and in few other countries: USA, China or Japan."